Check your privacy settings. 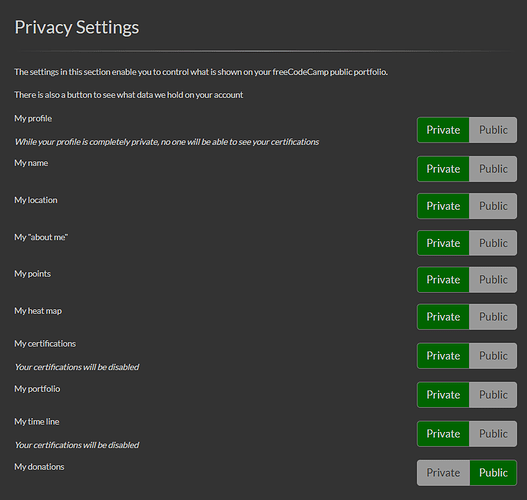 If your certificates or timeline are set to “private,” then your certificates will not be visible. Is the Responsive Web Design certificate live now? I have links listed for all five projects and I get a popup telling me that I have not completed the necessary challenges. Fantastic updates everyone. I would be great if we had links to the sub domains in the nave bar like before, or a link to a page with all the fCC subdomain links on it. Thanks! Can we add Swift OR Android coding to curriculum pls? Please add a way to report some questions which might not be clear enough. And please fix the bug when rewriting the page with the new React library. When you don’t close an HTML tag, it displays all uglified codes made by webpack, which is a really terrible factor to the performance of a page, as processing a long string for display purpose with React controlled forms is quite costly. In fact, it shouldn’t display any data if I have an error in my HTML. Thank you for all the free awesome guidance. Feels like we have a dictionary , I know the outline of the language now instead of just knowing a piece of puzzles from here and there. The new curriculum made it easier for me to understand Js better. I’ve just found out that my telephone validator, one of the projects that you claimed was being saved, is gone. COMPLETELY. The solution can be viewed from the settings page. I’ve also downloaded my user data to check if it’s in there, but no, it isn’t. Dear @QuincyLarson I am not able to view my previous submitted solutions. can you tell me please how can I view my previous solutions? thanks. loving it! I have been taking extra courses on udemy! Been working on Simon Says…that I went back to the site, and boom! new course! better structure. It’s going down now! Is it me or the scroll of the lesson has disappeared? Oh man, that’s awful. I hope that they fix it soon. Any update on the estimate of when the previous solutions will reappear in the “Curriculum”? My “Curriculum” items are marked as complete, but I still can’t access any of my previously written code. Thanks - appreciate any feedback! @maciek, I think @ArielLeslie’s earlier response answers your question. Thanks for a quick reply. I guess my follow up question would be… Assuming that I have not saved any of my previous challenge solutions (otherwise I wouldn’t be asking these questions lol) - if I want to claim a certification for a certain section and my “Curriculum” states that all of the challenges were completed - is there any way that I can prove that they in fact have been completed (if my previous solutions don’t exist anymore outside of the “marked completed Curriculum”)? To clarify - is the fact that in my “Curriculum” it states that everything has been completed (even though I don’t have the code proof) enough for FCC to give me my certification? Thanks again for the help - really appreciate it!